Alan Briggs isn’t shy about discussing his gift for communicating. In fact, he says God’s given him a creative genius when it comes to speaking, writing, consulting and building relationships. He’s an artist, and people are his canvas. But he’s not bragging—he’s simply redefining his natural talents as God-given genius. And he points out that he’s not alone; God has given everyone a creative genius to use for the advancement of his kingdom. 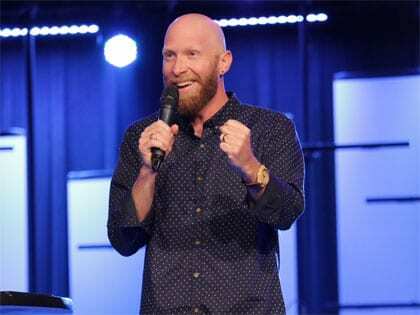 Briggs is multiplication pastor at Vanguard Church in Colorado Springs, Colorado, where he makes disciples and trains leaders to multiply. He’s also the director of Frontline Church Planting, where he leads and equips church planters in Colorado. He’s written three books, the most recent released this past fall. That book, Everyone’s a Genius: Unleashing Creativity for the Sake of the World, does more of what Briggs does best: equip church leaders to multiply. This time, he suggests leaders do that by recognizing, affirming and unleashing the genius in themselves and every Christ follower. Here’s what he wants you to know about creativity and the church. In Everyone’s a Genius, you encourage leaders to understand creativity as the gifts people naturally possess, rather than limiting our idea of creativity to a select few and ignoring those without “obvious” talents—or going elsewhere to find it. Why the emphasis on using what God’s given us rather than going after what he hasn’t? Two reasons. No. 1 is faithfulness. I think there’s a return to faithfulness that we’re realizing has always been needed. Maybe we’ve gotten a little too distracted by the hunt for impact or by some degree of leader or church envy, but I think we’re coming back to the idea to be faithful with what God has given us—in ministry, in place, in gifts. The reality is that God isn’t going to hold us accountable for what he hasn’t given us and where he hasn’t placed us. No. 2 is stewardship. To whom much God has given, much is required. We are entrusted as stewards to go and give. Everyone’s a Genius is a message of space. What’s your space? It could be where you work, play or live. Most of our weeks are lived outside of the church walls and church programs. The question is, are we living wisely and using our gifts in those spaces the rest of the week? How does that message work in the larger context of your work at Vanguard Church and at Frontline? Every church planter has to ask at the beginning of the church plant, “What’s the mark of this church? Where’s the genius, the spark? And what does this bring to the context of the community?” These are conversations I have on a weekly basis with church planters, asking how we can bless our community. Many church-planter conversations are around how a church is going to be a blessing to our city, and we begin to talk about the spiritual gifts leaving the building and what that could look like. Leaders can bless their communities by first uncovering and affirming the gifts and talents—the creativity and the genius—of the people in their churches. But we have to draw that creativity out of people, and we can often miss it. Why is that? Everybody is asking what counts as ministry and kingdom work. I think we’ve had too small a view of what kingdom work actually is. Even our spiritual-gifts assessments are usually to get people to serve inside the walls of the church. I’m a pastor, and I know we need children’s ministry workers. But if that’s the big vision we’re casting to our community, it’s not big enough. It’s the size of our church walls. I really feel like it’s a call to church leaders to say, “What counts?” I like to start with the core question. What people are already doing in their spaces of influence counts. I believe that’s where God uses people to do some amazing outreach. Evangelism happens most naturally when we’re doing what comes most naturally to us. We church leaders have done a poor job of affirming what people are already doing well, and I don’t think we’re looking very hard for it. I’ve been convicted to look harder. I call it being a genius spy. I believe church leaders should be looking for how the people of God are leaning into faith and doing his work. That real estate agent who can sell a ton of houses must be able to really connect with people. So how do we affirm what we already see? And our culture is primed for this kind of creative, genius-infused revolution. Our culture is fear-ridden and starved for affirmation right now. This could be the great moment for the church. This isn’t the time for a fearful church but for a courageous church. I believe that would speak deeply to our world. The world is waking up to creativity and to the “gig” economy. More people are freelancing and are hungry for collaboration and for using their creativity. Fewer people want to punch in and out from 9 to 5. I believe we, as a church, can actually help lead the way in this creative revolution happening in the workforce. We’re all searching for fulfillment. We’re all searching for a mission bigger than ourselves in a very egocentric culture. In a selfie culture, we want to be about others. That is winsome and countercultural, and I believe it’s deeply fulfilling to every single human. In part 2 of our interview, Alan Briggs talks about the difference between having a genius and being a genius, how church leaders should define creativity, and more.